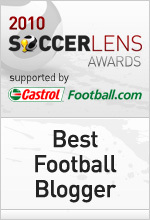 1) You’ve been nominated for Best New Football Site, Best Football Niche Site and Best Football Blogger, chosen by both fans and industry experts, how does it feel? Very nice, it’s a privilege. 2) What kind of year has 2010 been for The Zonal Marking? Very busy but also very rewarding. I set it up in the first week of 2010 and it gained popularity quicker than I expected. The final stages of the Champions League and obviously the World Cup gained lots of visitors and they’ve continued to come back for this season, so it’s been great. Focusing on a small area of the game was key, an area where the degree of fan interest was not reflected in the degree of coverage in the mainstream media. I don’t explicitly give personal opinion in the pieces which maybe makes it a bit different to a lot of blogs which are “I think…”. I was also fortunate in that a few journalists picked up on me and starting retweeting my stuff and followfridaying me on twitter, and the first time it really took off was when it was featured on the Guardian website, so I’m hugely grateful to the Guardian. 5) What’s next for The Zonal Marking? More of the same; I don’t think expanding or changing the content is a particularly wise idea. The only difference may be the summer, when I might do some “classic” matches to plug that horrible gap of no football. I have, it’s a good idea. I know the data all comes from OPTA who are terrific, their twitter feeds are superb and they also power the Guardian chalkboards that I use on the site. It’s interesting, the top two are who you’d expect, then there’s a few surprise names up there – but I suppose that’s the point. The best player in the world, in my opinion, is Lionel Messi.